When it comes to western joinery saws for woodworking, there are really only a few choices worth considering for anyone serious about using hand tools. The first option is to buy a good quality new saw from a reputable woodworking tool retailer or saw maker. The benefits of buying a new saw like this are obvious. You can be assured that your saw will be straight, sharp, and will perform its function without flaw right out of the box. As a new hand tool user, the up side here is that you can be sure that any issues that you have using the saw can be attributed to your technique and experience level and not a problem with the saw itself. The down side, however, is that a good quality new saw is not inexpensive and may be outside the budget of many new woodworkers. If the budget doesn’t allow for a premium, new saw, the alternative option is to buy an old saw. The main benefit of buying an old saw is cost. There were a lot of 12-16″ backsaws made in the late 1800s and early 1900s, and most of them are good quality tools once they have been restored to usable condition. As a result, these saws can typically be had for around $40-50. The down side is that no $50 western joinery saw is going to perform flawlessly as soon as you receive it. All old saws require some amount of tuning in order to be put back into service. Some just need to be sharpened. Others, however, may require quite a bit more work to straighten saw blades and backs, clean and polish the metal bits, repair damaged handles and saw nuts, and repair damaged and unevenly spaced saw teeth before the saw can be sharpened and set. If you have the skills and patience necessary to perform the work, you can end up with a wonderful tool that will glide through wood every bit as well as a high dollar premium saw for little more than the cost of the saw and several hours of your time. If you aren’t sure that you have the skills to do all of the work yourself, you can send the saw to someone like me to have some or all of the work done for you. 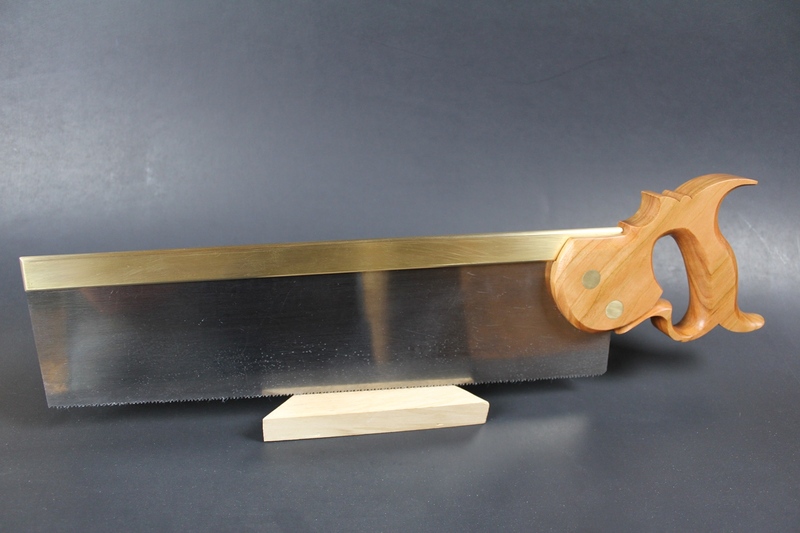 However, depending upon how much work you have done to the saw, the added cost of the restoration services can bring the total cost of the saw within a few Jacksons of a new, premium saw. So if cost is a factor, try to do most of the work that you can yourself. You can start with my process for cleaning a saw as the first step. I’ll go over my processes for doing some of the other repairs another time. If you’re willing to spend some time with some files and rasps, you can make a new saw that will function every bit as a premium new saw at a fraction of the cost. What I want to talk about today is a third option that is becoming more and more popular, and that is making your own saw. Now you might think at first that making your own saw requires way more skill than restoring an old one. If you plan to make one completely from scratch, only sourcing the raw materials, you’d be correct. But luckily, there are other options today that can help the new saw maker complete their first saw with little to no knowledge of metal work. The benefit of using some of these options is that you can end up with a saw that is dead straight, sharp, and ready to put right to use as soon as the last coat of finish dries. Of course the more pre-made components you use, the more expensive your saw will be, but it will still cost a fraction of what a new saw does. These were some of the first saws that I ever built (though not THE first). I bent the steel backs, made the split nut hardware, cut the blades, and filed all of the teeth by hand. 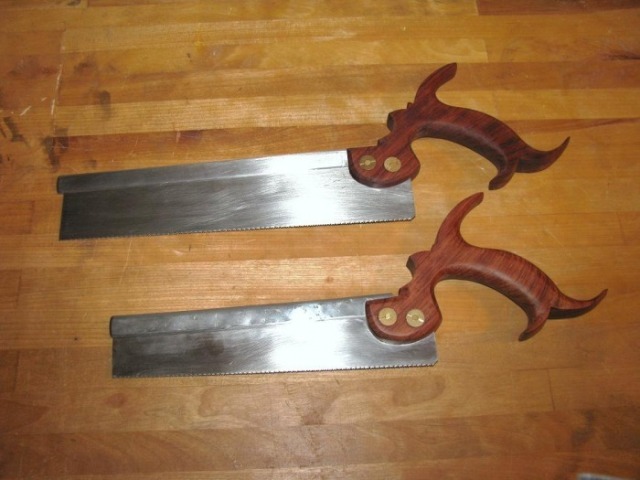 They weren’t the prettiest saws, but they were my daily users for many years, and the pair cost me less to make than one good old dovetail saw would cost to buy today. When I first started building hand saws some 12 years ago, no one was making saw components for sale. So those of us who were experimenting with making our own saws had to either plunder components like backs and saw bolts from old saws, or make our own from scratch. The very first saw that I ever made cost me a whopping $25 in materials to build. When I was finished, my saw looked like anything but a high dollar premium saw, but it cut flawlessly. More importantly, I had proven to myself that it could be done, and I have been improving my designs and execution ever since. Today, I have just about all the hand saws that I need for myself, but I still continue to build saws for sale from time to time. Over the next few posts, I’m going to go through my process for building a closed handle tenon saw. For the wood and the saw blade that I’m using for the saw, I’ll be starting from the raw material (i.e. my “saw blade” is just a piece of 1095 spring steel). I’ll be cutting the saw blade to size and shape, and shaping the handle from a piece of rough sawn cherry. For the saw’s back and bolts, I purchased a pre-milled brass back and brass split nuts from several of the current commercially available options. However, at each step of the process, I’ll discuss multiple options for multiple budgets and perhaps even show you how to make the components that I chose to buy in case you want to do so yourself. Posted in Hand Saws, Project Logs, Toolmaking and tagged saw making, tenon saw. Hi Bob, glad you’re back on line. Have you ever considered using an old saw blade? I picked up some warranted superior saws for $5 each at a garage sale to use for scrapers and scratch stock but still have a lot left. You bet. I’ve got an old 26″ saw right now that I’ve cut down to panel saw size because it was damaged at the toe beyond repair. No reason you can’t make a back saw from one. The blade will be a little on the thick side but it will work just fine. This is going to be absolutely great! Please keep it coming.